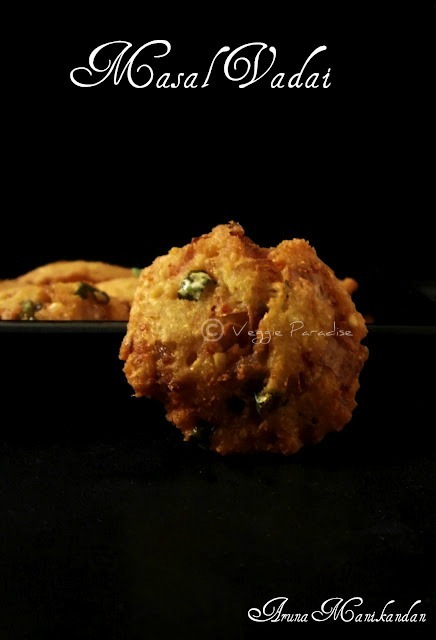 Masala vadai - This is probably the most popular snack made in South Indian homes and one that is sold on every street corner shops. It is very simple to prepare and they taste delicious when eaten fresh as keeping them for any length of time makes the outer shell of the vada go stale. Wash and Soak the chana dal in enough water for 2-3 hrs. Drain and blend in the mixer to a coarse paste ,adding very little water. Transfer the batter to a bowl, add the onions, coriander leaves, green chillies, asafoetida along with salt and mix well. Heat oil in a pan, take small portion roll into a round ball ,and flatten it in your palm. Drop the vada in the oil, and deep fry them until golden brown. Looks so inviting n yumm!! love that crispy perfect brown colored outside..
Amazingly crispy and delicious looking vadais. Wonderfully prepared. Lovely pics of the crispy vadais. Looks very tempting! 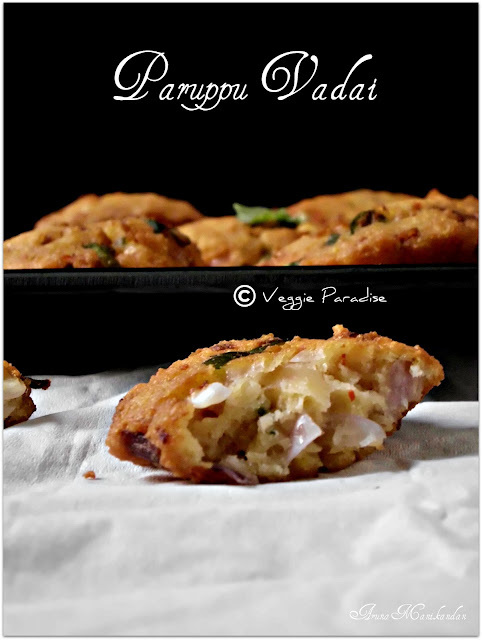 Feel like munching some, super crispy vadas..
Masal Vadai is my fav snack. I am yet to tate a good eat out here that sells a good one. It is not as good as the one at a tea shop in India. 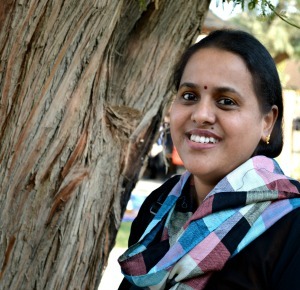 The vadai's look beautiful and the photos are so nicely taken. 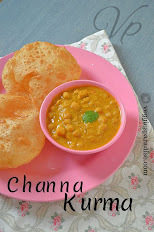 Looks lovely, though I am not so fond of masala vadai, the husband and his family loves it. One of my favorite vada !! so crispy and yummy !! Was just craving for some this evening and I see it here...Yummy..
Looks very very delicious. They are amazing cute evening snacks. my fav vadai looks rollicking good ! Looks so crispy and delicious feel like having some. Nice crispy delicious vada..love it! 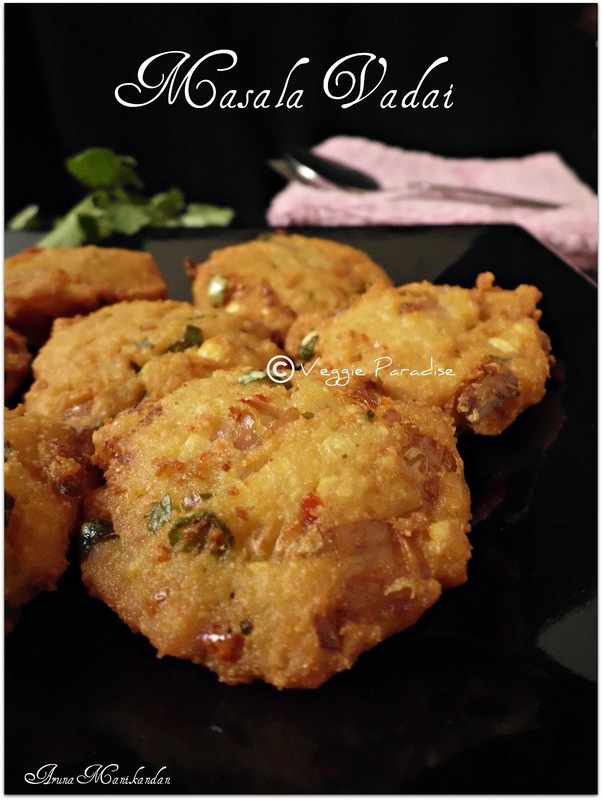 Masala vadai looks spicy , crunchy and yummy.